Not long ago, I took a look at Celgene (NSDQ: CELG) as a rebound candidate in 2019. The company has since agreed to sell itself to Bristol Myers (NYSE: BMY) for $74 billion, the biggest pharmaceutical deal in history—pending shareholder and regulatory approvals. The deal led to a jump in CELG price and sparked excitement in the biotech space because investors think it could stimulate more wheeling and dealing. The stock I will cover today is another of the Big Four whose stock price has struggled in recent years. A sudden stock price jump like Celgene thanks to being taken over is nice, but mergers and acquisitions are difficult to predict. Instead, let’s see if Gilead is a worthy investment on its own. 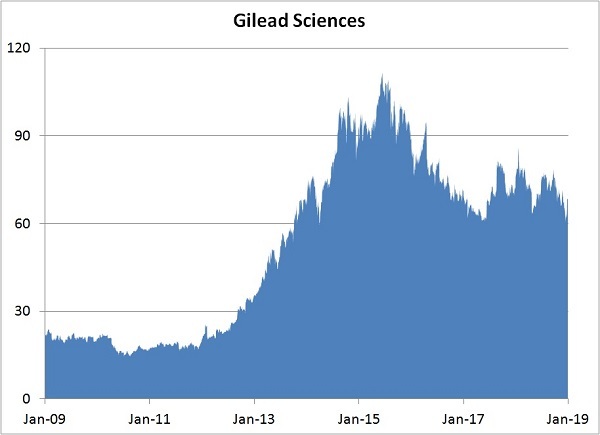 Gilead is one of the largest biotech companies in the world, with a market cap approaching $90 billion and more than $21 billion in annual revenue. The company has a couple of billion-dollar drug franchises that treat, respectively, HIV and HCV (hepatitis c virus). Today, an HIV diagnosis is no longer a death sentence thanks to drugs like Gilead’s Genvoya, Truvada, and its newest drug Biktarvy. Patients on modern HIV medication can live normal lives for years and many never progress to AIDS. Without treatment, HIV usually becomes AIDS in about 10 years. Genvoya (tenofovir alafenamide) is Gilead’s fastest-growing HIV drug. Sales likely exceeded $4 billion in 2018 (final data not yet available). It is effective and has a better safety profile compared to older drugs from the same tenofovir class. Gilead’s top drug for hepatitis c is Harvoni, which has cured nearly every patient. It’s a wonderful drug, but from a business point of view a complete cure has its drawback. Harvoni sales are only a fraction of what they used to be. How Has Gilead Sciences Stock Performed? Gilead bought out Pharmasset in 2011 and got its hands on what turned out to be a miracle drug—sofosbuvir. It is no coincidence that the stock started to take off in 2011. The drug was marketed under the names Sovaldi (sofosbuvir alone) and Harvoni (Harvoni is a combo of Sovaldi and another drug ledipasvir) and was a smash hit. The treatment was expensive but very effective. Most patients were cured of hepatitis c in less than half a year. Sovaldi and Harvoni sales reached a combined $19 billion at the 2015 peak, but demand has been falling since. Once cured, patients don’t need treatment anymore. Additionally, competing drugs from other drugmakers have forced Gilead to lower pricing. As a result, Gilead’s HCV drug sales are only around one fourth of what they used to be. As a result, company revenue is falling as well. The stock, too, peaked in 2015. 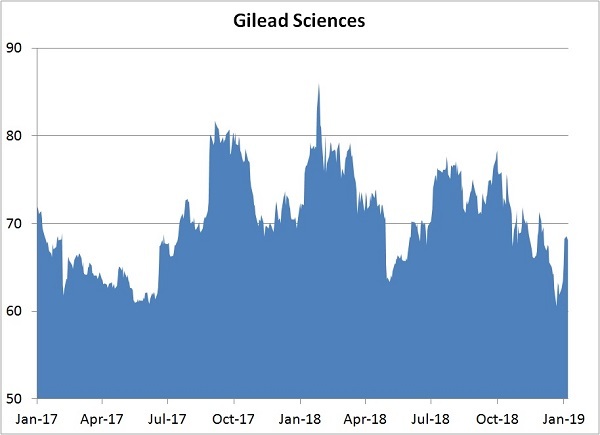 How Has Gilead Sciences Stock Performed In 2017/2018? Mainly as a result of falling revenue from its HCV drugs, Gilead’s revenues have been falling. Since 2015, overall company sales are down by about one third. The lack of revenue growth has been tough on the stock price, which was only about breakeven in 2017 and 2018. Ironically, Sovaldi and Harvoni were so effective, they shrank the addressable market as patients were cured. Smaller demand and downward price pressure led to falling revenue. The HIV portfolio has been growing but it hasn’t been enough to offset the sharp sales decline in the HCV portfolio. Gilead has turned from a growth stock into a value one. Who Are Gilead Sciences’s Rivals? Glaxo and Pfizer are both large pharmaceutical companies with large portfolios of drugs on the market. They co-founded ViiV Healthcare to concentrate on developing drugs to treat HIV. ViiV has a portfolio of HIV products on the market including Triumeq and Tivicay. AbbVie is another Big Pharma player with a large portfolio targeting different diseases. AbbVie directly competes with Gilead in treating hepatitis c. AbbVie’s Mavyret was approved in 2017 and has been a blockbuster. The company priced the drug about a quarter of what Gilead was charging for Harvoni. Mavyret works just as well as, if not better, than Harvoni, so the pricing strategy has worked big time. Through the first three quarters of 2018, the drug had already exceeded $2.6 billion in global sales. For comparison, Harvoni sales had fallen to less than $1 billion in the same period. And Gilead’s newer HCV drug Epclusa (sofosbuvir plus velpatasvir) had $1.5 billion. Merck is a behemoth, with a market cap of around $200 billion. It, too, has a large diversified portfolio targeting different diseases. In reaction to a crowded marketplace, the company has discontinued its research in hepatitis c, but its Zepatier is already on the market. Zepatier had about $350 million in sales through the first nine months of 2018. Year-over-year Zepatier sales plummeted 75% and a rebound doesn’t look likely. Fortunately for Merck, Zepatier is only a tiny sliver of its overall revenue. The company has plenty of other drugs to pick up the slack. Will Gilead Sciences Stock Go Up In 2019 (Should You Buy)? The fall in HCV sales has been ugly, but at this point the decline has been largely priced in. Gilead has decided to authorize generic versions of its top HCV drugs even though the patents won’t expire for many years. The reasoning behind this move is to stabilize prices at about $24,000 a year. Brand name drug pricing is very complicated and can result in highly variable prices to different buyers. The move to generics should keep the prices right around the intended level. In the long run, HCV is probably still a $5 billion a year market that Gilead can split with AbbVie. Thus, the strategic move is expected to stabilize the pricing in the HCV market and reduce the bleeding in the HCV portfolio. Meanwhile, Gilead’s HIV portfolio looks strong. HIV patients need continual treatment to keep the virus in check, which means HIV drugs offer recurring revenue. Genvoya has been a big hit so far and Gilead’s latest HIV weapon Biktarvy is off to a fast start. Biktarvy was approved in February 2018. The drug is a combination of three separate drugs and in clinical study it showed strong efficacy and few side effects. So on one hand, HCV sales should at least decline slower, and on the other, HIV sales will be growing. Additionally newly marketed drug Yescarta—gene therapy for a blood cancer—has been slow out the gate but sales could pick up. Gilead’s pipeline also has interesting candidates that could become blockbusters. They include candidates in NASH and cancer. NASH is a certain liver condition for which there’s no FDA-approved treatment. The company has five Phase III clinical readouts expected in the first half of 2019. If results are good, it will point out some paths for future growth to investors. Will Gilead Sciences Stock Go Down In 2019 (Should You Sell)? Although the generic HCV strategy should help to stabilize pricing, it’s not a guarantee. HCV sales could continue to fall sharply. 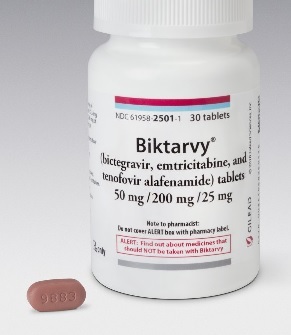 If HIV patients leave the company’s older HIV offerings, Gilead needs them to go on Genvoya or Biktarvy. HIV currently forms the backbone of the company’s revenue base; it can’t afford disappointments here. CEO John Milligan and chairman (and ex-CEO) John Martin are leaving after many years with Gilead. New CEO Daniel O’Day comes from a marketing background, not scientific or medical. It’s fair to question if he can lead the company to new breakthroughs. There’s no guarantee that the data readouts will be positive. Investors want to see signs of future growth. If data are disappointing, the share price will take a hit. Gilead won’t re-approach its previous revenue peak—$32 billion—anytime soon. However, the real question for investors is when and if the company can grow from its current level of $21 billion. The company’s HIV portfolio now accounts for about two thirds of revenue and will become an even larger part of the revenue pie. HCV revenue probably still has more room to fall, but at a slower rate than in recent years. With HIV sales likely to continue to grow, and other products like Yescarta potentially becoming a billion-dollar drug, chances are Gilead’s worst days are behind it. But to return to its former glory days, the company needs additional weapons in its arsenal. The key will be the candidates in the pipeline. If Gilead can give investors better visibility into future growth prospects, the share price should rally. We’ll know more later this year, when several late-stage clinical results are unveiled. As I’ve just explained, Gilead faces opportunities as well as risks. But how would you like to make money, regardless of market or economic uncertainties? Over the past three months, my colleague Linda McDonough has deployed a consistently profitable investment strategy through her premium trading service, Profit Catalyst Alert. This money-making system has generated total gains of 592% for her followers. That’s enough to turn $5,000 into $34,600. Want to get in on the action? Click here for details.